A government official claims China will have 41 nuclear power units operating by 2015, with an additional 20 plants being built. China will significantly increase the amount of energy it generates from nuclear sources over the next few years, Zhang Huazhu, chairman of the China Nuclear Energy Association, told a forum in Guangdong Province on Wednesday. Zhang said China will have an installed nuclear capacity of 42 gigawatts (GW) by 2015, which is expected to be about 10 percent of global nuclear output at that time. China currently has 6 nuclear power plants and 15 working nuclear power units, according to Chinese media outlets. Last year it generated 12.5 GW of power from nuclear sources, which accounted for about 1.8 percent of China’s entire electricity generation and roughly 3.5 percent of the world’s total nuclear energy production capacity. The 42 GW estimate is slightly higher than the 40 GW figure that an October government white paper on energy policy cited as China’s target for 2015. Both figures are substantial down from the initial 12th 5 Year Plan (2011-2015) goal of producing 50 GW from nuclear sources by 2015. The failure to meet the 50 GW target is due in large part to Japan’s Fukushima nuclear meltdown in March 2011. Since then the Chinese government has treaded carefully on nuclear energy, including instituting an initial six-month moratorium on the construction of nuclear power plants in the wake of Fukushima. 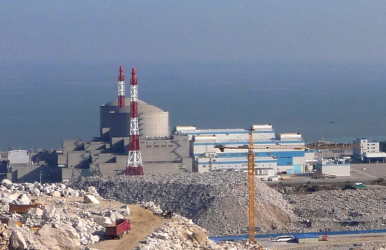 When the suspension was first lifted in October 2011, China appeared to embrace nuclear energy as eagerly as before, with one Chinese official telling the New York Times at the time that China would still meet the highly ambitious 50 GW target. It has since scaled back this estimate. Besides reducing the pace of its nuclear expansion, the Chinese government has been careful to emphasize it has learned the right lessons from Japan’s nuclear tragedy. “With their good performances and the carefully chosen locations of the sites, China's nuclear power plants have little chance of repeating what happened in Fukushima," Zhang said on Wednesday. This comment seems puzzling given that the State Council said last month that it would only approve the construction of nuclear power plants in coastal regions in the years ahead. This makes complete sense from an economic standpoint given the greater demand for electricity in China’s economically dynamic coastal regions compared with more inland parts of the country. However, as Fukushima and Hurricane Sandy more recently (and less dramatically) demonstrated, nuclear power plants located in coastal regions are vulnerable to weather related disasters like tsunamis and hurricanes. Unfortunately, this issue is likely to plague the region in the decades ahead as energy starved nations throughout Asia seek to expand their nuclear energy industries in order to reduce dependency on foreign energy sources in an environmentally friendly manner. With many of these countries—such as Vietnam and other Southeast Asian nations— lacking the enormous resources China can contribute to nuclear security and disaster relief efforts, this continue to be an area where Beijing can generate goodwill with its neighbors. Chinese leaders prepare to gather to chart an economic path for the People's Republic through 2020.